There's an Inktober 2018 challenge with prompts for drawing each day which you can follow on Instagram. 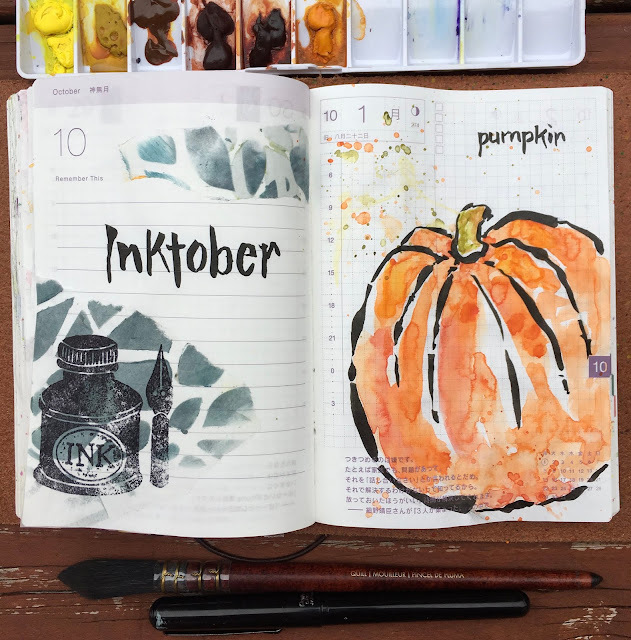 I've created my own version of Inktober using my Hobonichitecho, Pentel brush pen and watercolors. It's a quick way to art everyday and forces me to keep it loose in the style of etegami. Your art journal reflects your unique journey. 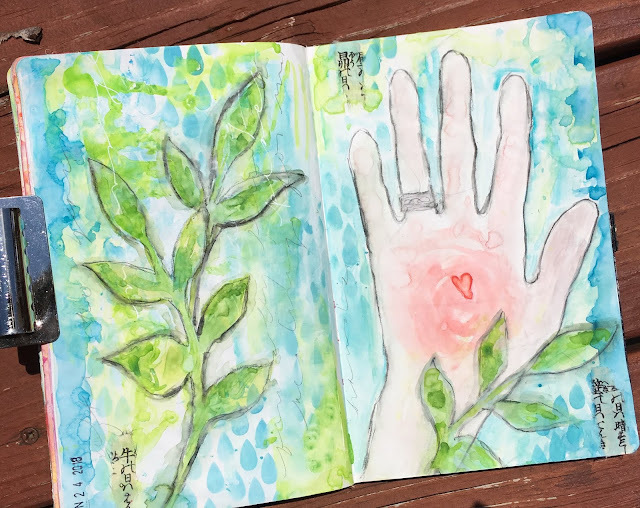 I’m sharing a spread representing the healing treatment I'm currently receiving for my hands at Damany Center. I started with gesso on the page before spreading a thin layer of watercolor. The colors selected will help my recovery: BLUE to bring me patience; GREEN to represent growth and new beginnings; RED to bring new life into my hands. 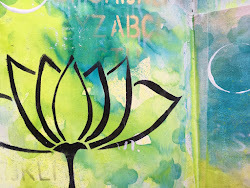 I created my own own stencil by cutting branches and leaves from a sheet of acetate and painted the green watercolor thru the stencil. Then I traced my hand and used a stabilo pencil with waterbrush to define the edges. My written feelings are hidden in the background by quickly scribbling around the images. I'm healing thru physical therapy and art journaling therapy! 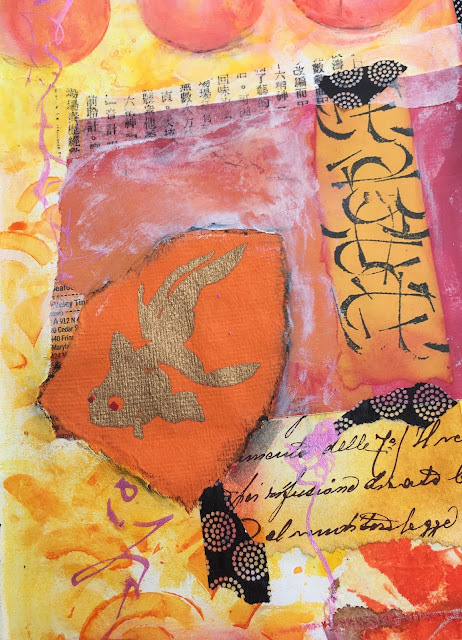 Inspired by a walk near a koi pond, I’m celebrating the beginning of summer with YELLOW and ORANGE: happy, joyous colors! And the koi symbolizes good luck and prosperity. Next time I will videotape this crazy (no thinking) layering of stencils, gelatos, collage papers and inks. 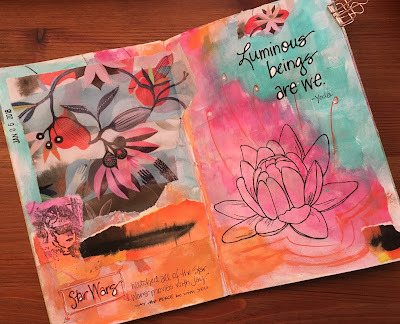 It's time to put on some uplifting music, grab your journal, and create some colorful pages! 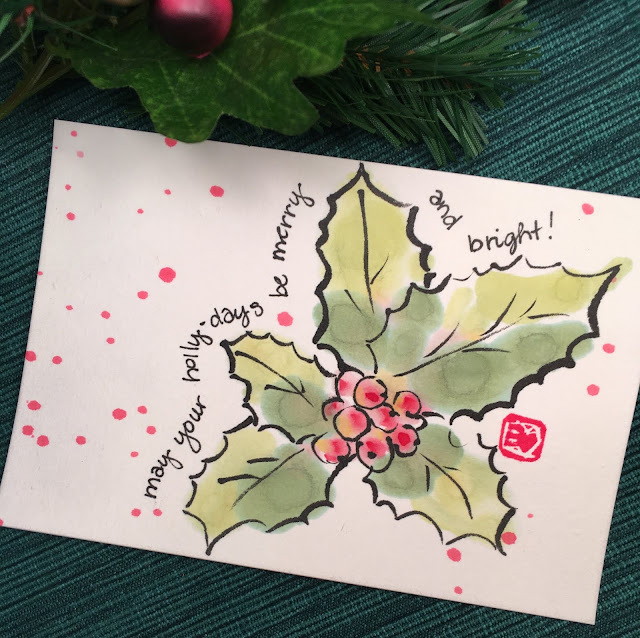 Using an old gift card is a great way to spread paint! It’s fun, fast and stress-free, in addition to using very little paint. 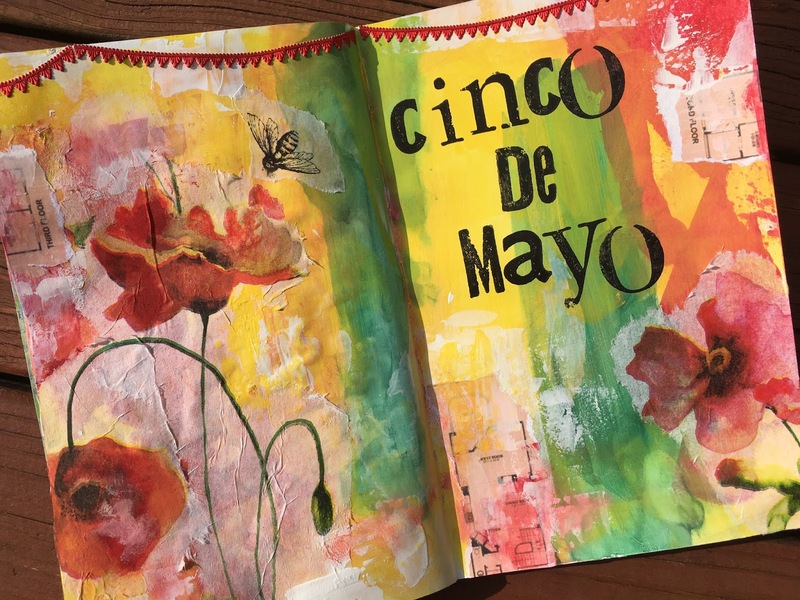 Here I chose the Mexican flag colors, but added YELLOW -- because it loves to party! I added scraps of paper from the day including a napkin I obviously didn’t use but saved for my journal instead! 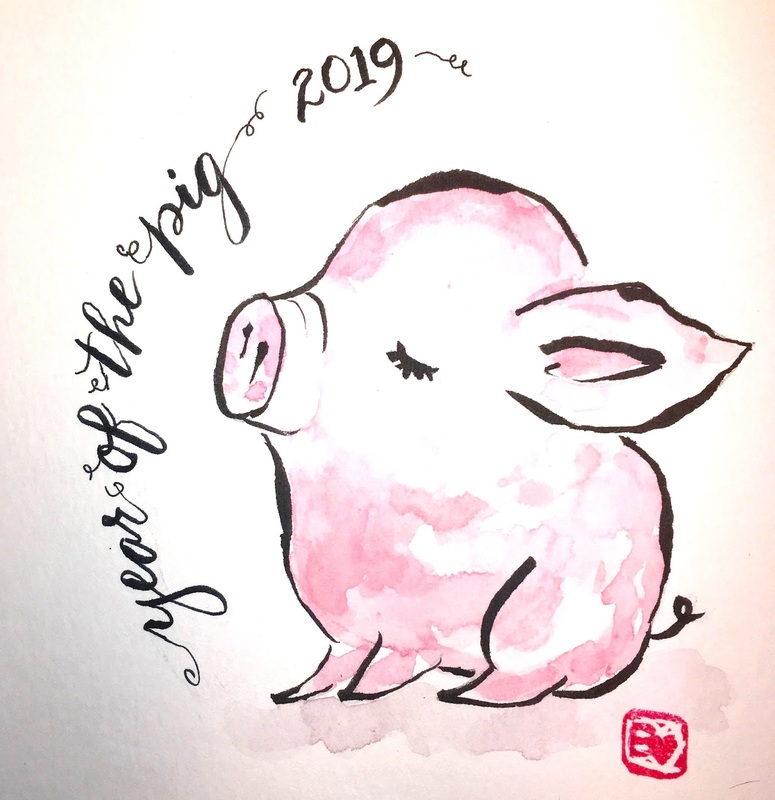 I intend to add some personal writing to the page. What memory will you document today? 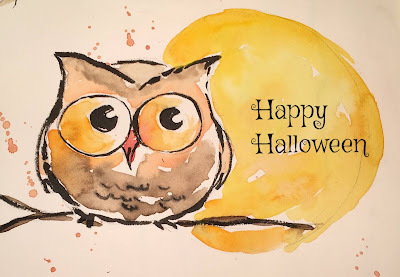 I love playing with watercolor and watching the magic of colors blend together. 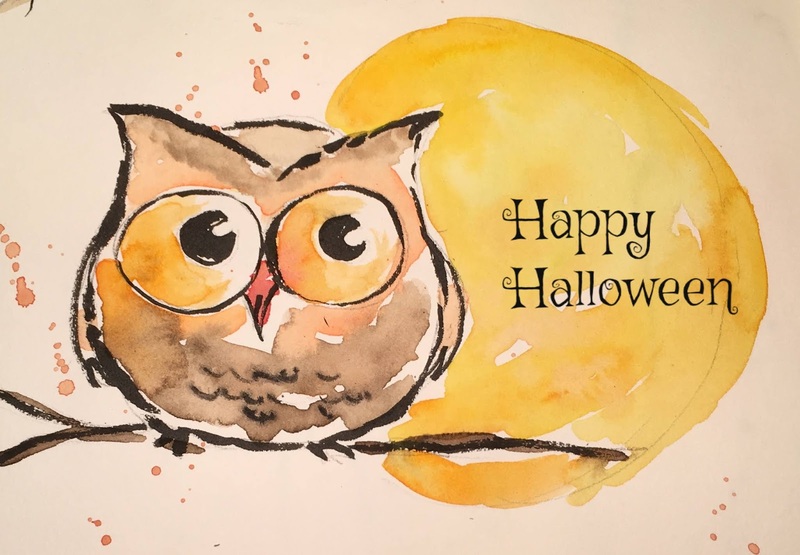 Nothing 'beets' the magic of watercolor! And let's celebrate the uniqueness of you! Start with Distress inks applied with a sponge using a honeycomb stencil. Then use a Pentel brush pen to draw the image. A small stipple brush can be used to color the image with Distress inks. Finally, add your text and scraps of washi tape and stamped rice papers. Use YELLOW, of course, the color of optimism, happiness and celebration! I am loving my tiny moleskine journal where I document inspirational quotes. 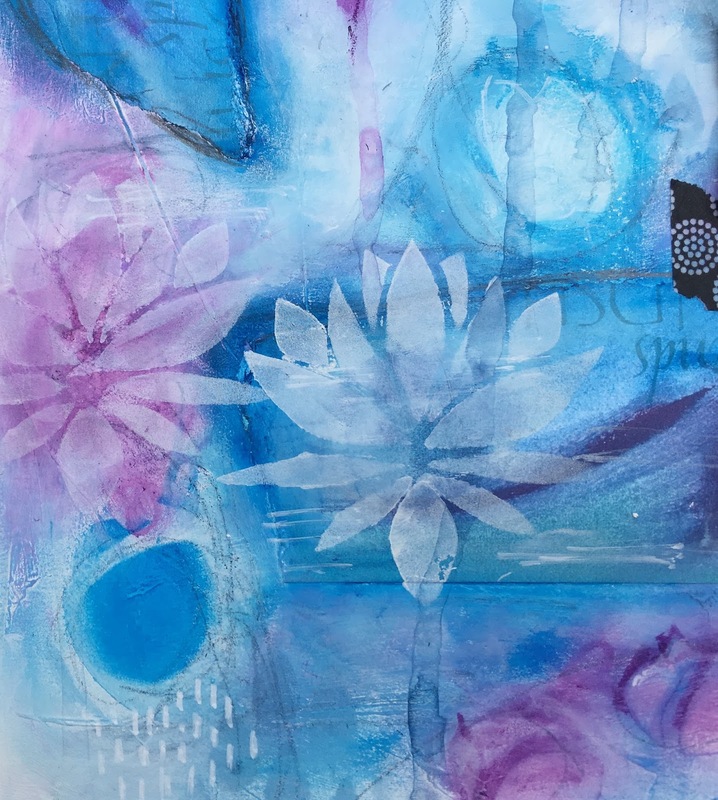 Here's the latest one created with layers: 1) start with Distress oxide ink sponged onto page; 2) repeatedly stamp background images; 3) add color-coordinating washi tape; 4) stamp tree image onto dyed coffee filter paper; 5) Glue paper to page. 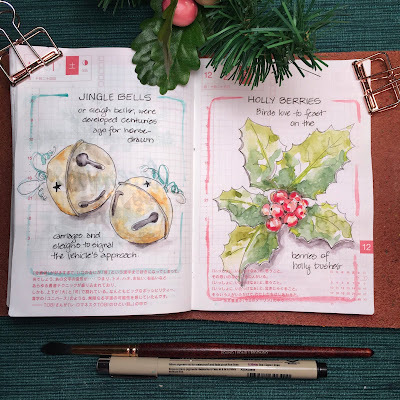 6) Add torn pieces of paper and accent areas with Inktense pencils. 7) Use tiny alphabet letters to stamp the quote. For an easy way to make your own stamps, cut the image from foam instead of carving. Here are the materials I used. It has been raining quite a bit in the Northeast lately and we're getting a little tired of it. 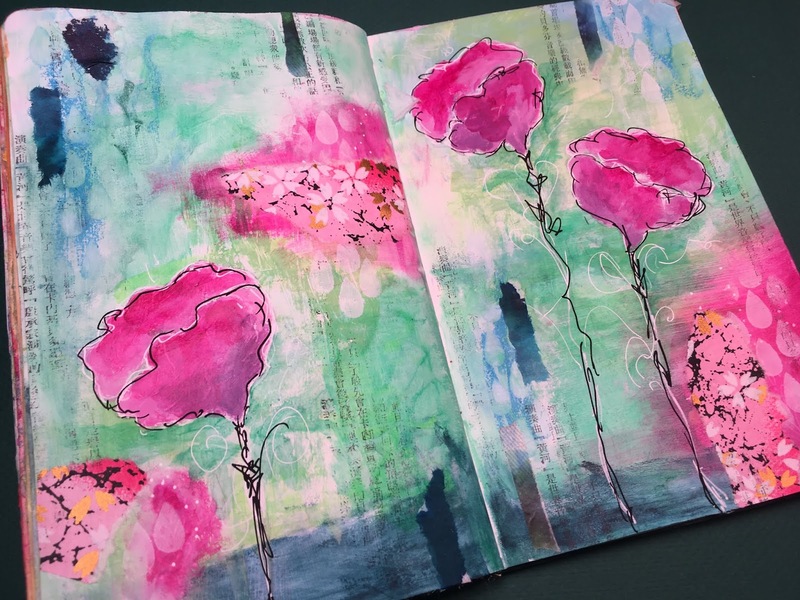 I try very hard not to let the weather get me down, but allow it to inspire me when art journaling. 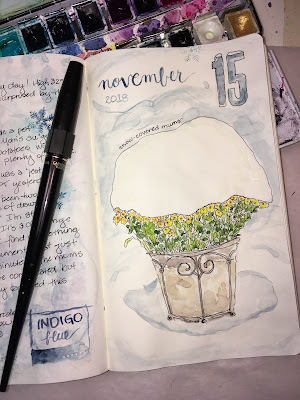 I guess the "blues" came out when I started journaling about the rain and then some flowers, and who knows what will come next. I'm never really finished with a page because I see opportunities for more layers. I hope you let the weather inspire you! 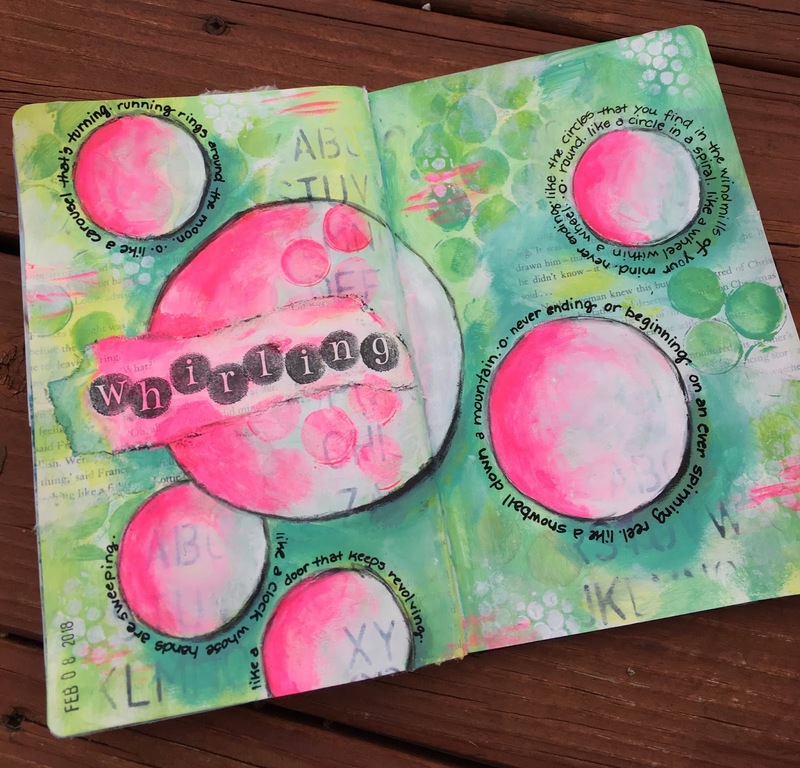 Music is a wonderful way to inspire your art journal pages and your state of mind! Turn on a favorite playlist, get out the paint and see what happens! Here's a spread inspired by my personal moments with the song “The Windmills of Your Mind”. For this spread I started with gesso, added layers of paint, stenciling and paper for dimension, and then wrote lyrics around the “circles that you find”. What song speaks to you today? What message is the song telling you? Grab your art journal and playlist to enjoy both art therapy AND music therapy while journaling! One of my favorite songs is "Baby, it's cold outside". Sung as a duet, usually during the holidays, this song is now the theme of our cold, January month. My studio doesn't have heat, but I do run a tiny space heater to spend a little time there. I managed to create a few pages in my journals despite the cold. 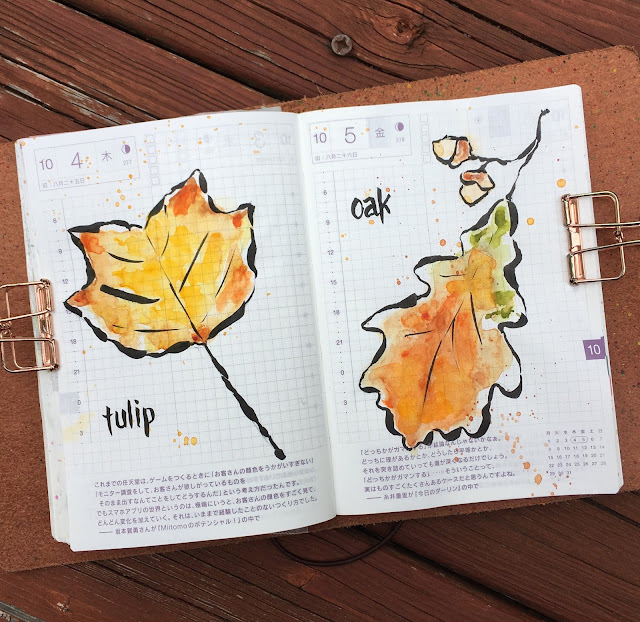 My favorite so far is the quick sketch of birch trees in my mini moleskine. 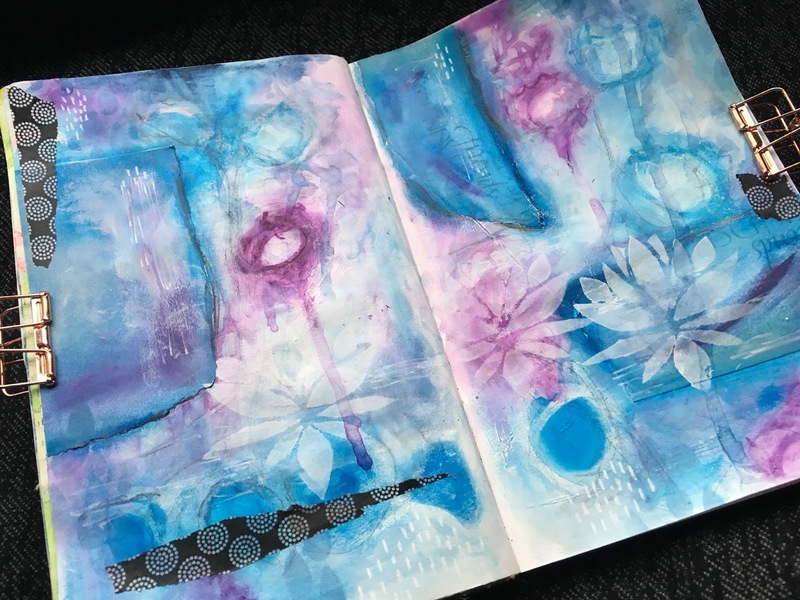 This journal doesn't take too much wet media, so I sponged ink and added a light spray of silver acrylic. 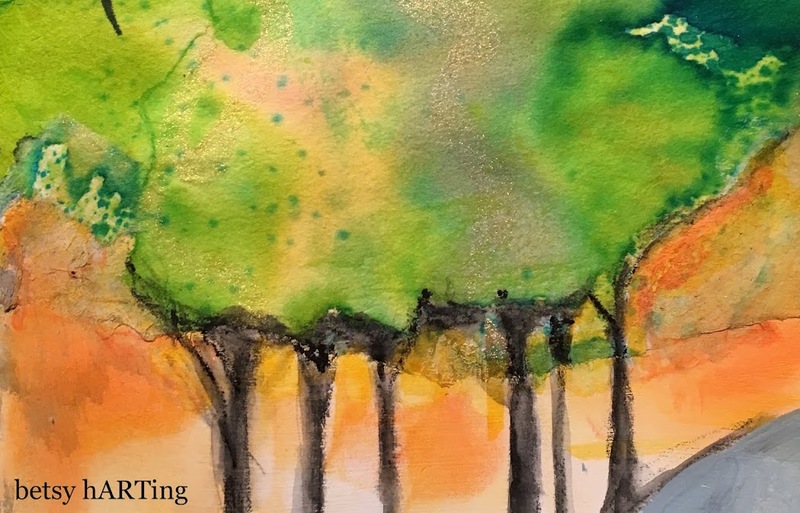 I used an Inktense black pencil and a dry brush layer of gesso for the trees. I always add scraps of paper that are from my personal painted paper stash. 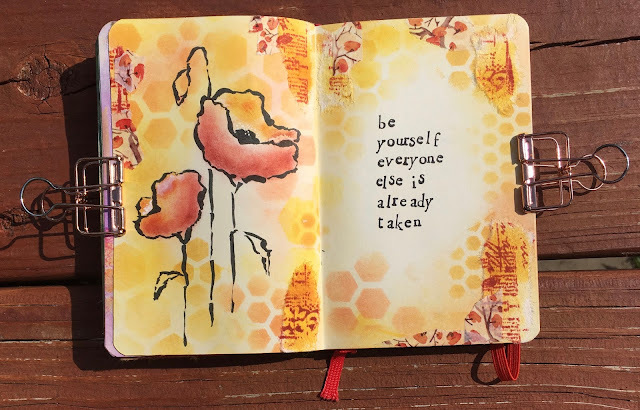 This small journal continues to be my inspirational quote journal. My husband and I recently watched all the Star Wars movies in chronological order - to see the whole story unfold. It inspired me to create a fun spread dedicated to the Force and our fun time together. 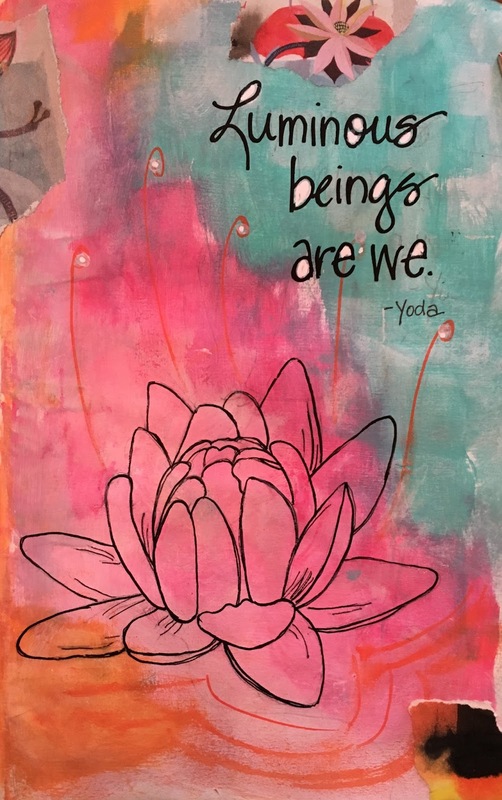 I practiced a lotus line drawing and then used Yoda's quote: "Liminous beings are we" for my focus! Stay warm and enjoy some journaling of your January! Started with line drawing over painted background.